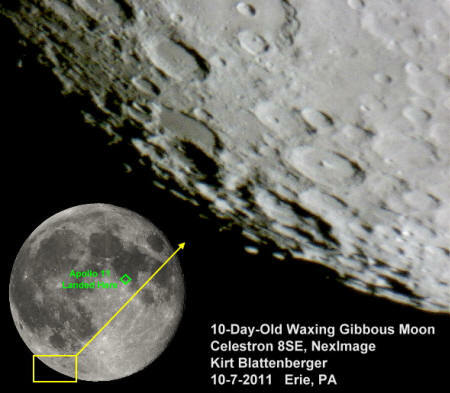 This is the first really good image made using the Celestron NexImage camera and my NexStar 8 SE telescope. Registax version 2 was used for stacking the best images to produce this final version. The date was October 7, 2011, and the moon was 10 days old, in its waxing gibbous phase. Since taking this image, I have vastly improved both my picture-taking skills and also now have an electric focuser, which makes a huge difference in being able to get a good, sharp focus while watching the computer display.